We had the privilege of working with a wonderful couple who were in search of the perfect ring to reset her original diamond. She had a definite idea of what she loved and one of her main goals was to use her own diamond in the center of a double cushion shaped halo. They looked at other places and nothing was a perfect fit to her wishes, as the settings that matched the style would not accommodate her diamond. Initially she was discouraged, but I urged her not to settle for anything different than her perfect "bling". 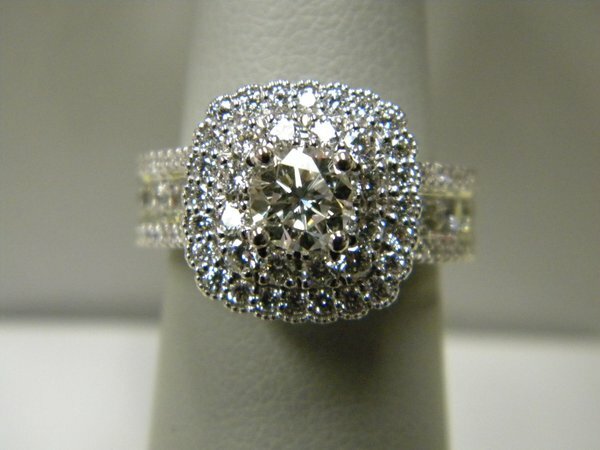 We found the perfect ring, redesigned the top halo to exactly fit her diamond and an incredible treasure was born. Happy Anniversary to this awesome couple!